Underneath the Raderbrücke (a.k.a. Europabrücke) near Rendsburg. The Bridgehunter’s Chronicles is doing an upgrade of the tour guides of the bridge-laden regions the author visited, by relocating them to the wordpress version of the column and updating them with maps and information. This includes the series on the Bridges along the Baltic-North Sea Canal in the German state of Schleswig-Holstein, which the author visited in 2011. Unlike the areavoices version, the tour will be done in reverse order starting with part I on the Grand Canal, followed by part II on the Rendsburg High Bridge, part III on the Alter Eider Canal, which runs parallel to the Grand Canal between Rendsburg and Kiel, and lastly, the bridges in Kiel, the state capital and where the canal empties into the Baltic Sea after a 90-km trip across the state. Our first stop on the tour of the canal area in northern and central Schleswig-Holstein is the bridges along the Grand Canal itself, known as the Baltic-North Sea Canal (in German: Nord-Ostsee Kanal. To understand more about the canal, one has to look at the history of it, which is plentiful in color. We already know that the first canal followed the same path as the river Eider, swerving about like a snake through Knoop, Rathmannsdorf, Kluvensiek and Schinkeln, running parallel to the present day canal between Kiel and Rendsburg before taking a more northerly route in the direction of Friedrichstadt and Tönnern before emptying into the North Sea. As the decades wore on however, the boat traffic increased in size and volume and despite its unique construction, the canal locks, let alone the double-leaf bascule bridges built to cater to horse and buggy at that time, were no longer able to accommodate the marine traffic. Therefore beginning in 1887, engineers of the German Navy embarked on a plan to construct a newer and wider canal that would run straighter than the Alter Eider and on a shorter length than its predecessor so that in the end, the Grand Canal would flow southwesterly from Rendsburg, past Gruenental and Hochdonn, and emptying into the North Sea at Brunsbüttel, approximately 65 km south of Friedrichstadt. The length totalled 90 km, which is more than half the distance of the Eider Canal. While the canal was built as a means of providing a short naval route instead of going around Denmark, the Grand Canal today serves as a shortcut for the shipping and commerce. Located just 10 km west of the Olympia and Prince Heinrich Bridges, this bridge is unique because of its unique design. Made of steel, this bridge features a half-pony and half deck arch design. Built in 1894 by Hermann Muthesius, it used to feature a through truss design in a form of a Howe design. Its decking featured rail traffic between Kiel and Flensburg for the eastern half and vehicular traffic for the western half. A picture of the bridge can be found here. Yet, as mentioned in the bridge quiz a few weeks ago, the bridge became a safety hazard by the early 1950s, as collisions at the portal entry were the norm- in many cases with injuries involved. Henceforth, beginning in 1952 and lasting for two years, the through truss portion and the concrete portal entries were removed, the roadways were reallocated and separated with a barrier to ensure through traffic and better passage, additional steel supports were added to the deck arch sections, and the entire bridge was stripped down to resemble its present form today. The stripped down version of the Levensau Bridge was reopened to traffic in 1954 and continued to be the lone link between Kiel and Levensau for another 20 years. An additional bridge was added to relieve the bridge of heavy masses of traffic in 1974. The bridge still remains in use, yet its days will soon be numbered. Plans are in the making to demolish the bridge and replace it with a tied arch span as part of the plans to widen and deepen the Grand Canal. Specifically, the new span will be built on top of the old span, which will then be dismantled one-by-one until only the abutments are left. They will be preserved and used as observation points as well as a place of habitats for a rare species of bats that exist inside. At present, no work has been done on the bridge due to funding and regulatory issues. Yet when the green light is given, the project is expected to be completed with three years. About a third of the way down the canal we come to Rendsburg, a city of 30,000 that once prided itself on the cast iron industry, but is now simply a tourist trap. Rendsburg is a rather quiet community with friendly people who enjoy talking about its heritage and history. And the city should be proud of it, especially when it comes to its bridges. Several bascule bridges were erected over the Alt Eider Canal in and around Rendsburg, most of which were built by the cast iron company Carlshütte (for more information, please refer to Part I and the Kluvensiek Bridge). Yet as iron became a fad of the past thanks to the coming of steel, so was the canal itself as the Grand Canal replaced it and effectively made these bridges obsolete. Today another landmark overshadows the city, which we’ll talk about in the next article with the Rendsburg High Bridge, yet two other crossings existed over the Grand Canal: The City Tunnel and the Europe Bridge. The City Tunnel was built in 1961, replacing the steel swing bridge, built using a cantilever truss design. That bridge featured two spans, each with a turning wheel, that would turn outwards to allow ships to pass. Because of the traffic congestion along the main street going through Rendsburg which the bridge carried, combined with the rust and corrosion and the hindrance of marine traffic, that bridge was taken out of service in favor of two tunnels, each one carrying one-way traffic. Two additional tunnels for bikes and pedestrians were added in 1965. At the same time of the construction of the tunnel, plans were approved to construct an Autobahn-Bridge spanning the Grand Canal. The 1491 meter long bridge (with a 221 meter main span) was christened the Raderbrücke (or Europabrücke), as it not only connected Flensburg and Hamburg via A7, but it created the longest Autobahn in not only Germany (at 961 kilometers in length), but Europe, connecting Flensburg with Füssen in Bavaria, but Scandanavia (namely Kolding, Aalborg, Copenhagen and Stockholm) with the Alps region (and with it, Austria and Switzerland). The bridge has been serving traffic since its opening in 1972. However, plans are in place to replace the entire structure to better accommodate Motorway A7 beginning in 2018. A new span will be built alongside the current one, which after that bridge is open to traffic, will be torn down and replaced. All in all, two bridges with three lanes in each direction will be in service by 2026. Located near the town of Beldorf, this 1892 structure, featuring a half through and half arch bridge and serving a local road and railroad line. Little has been mentioned about this bridge except for the fact that it is most likely the second bridge built along the canal by Hermann Muthesius, the same person who built the Levensau Bridge near Kiel. Furthermore, it was one of two bridges in Schleswig-Holstein that carried both vehicular and rail traffic (the Heide- Neumuenster Line). The Lindaunis Schlei drawbridge is the other bridge. 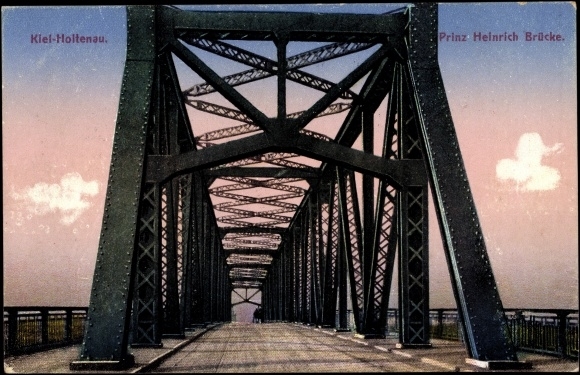 The bridge served traffic for 92 years before severe rust and corrosion on the superstructure led to first a severe weight restriction, forbidding trucks from using the bridge, later the German Railways to cease train service across the bridge, and finally its eventual replacement with the present structure, a Warren through truss bridge with no vertical beams. The arch bridge, deemed unsafe even for pedestrian use, was taken off its foundation using two massive cranes in 1988 and cut up and hauled away for scrap metal. Only the brick abutments, once used as portal entrance before its partial demolition in 1952, remain as observation decks. Unique is the fact that the state shield of Schleswig-Holstein, made of iron, can be seen while passing under the new bridge. Featuring Warren deck truss approaches supported by steel bowtie-like trestle towers and a Camelback Warren through truss main span over the canal, the 2218 meter long Hochdonn Viaduct cannot be missed while travelling along the Grand Canal. Built between 1913 and 1920, this bridge is possibly the third bridge built by Friedrich Voss, who had previously built the Prince Heinrich Bridge near Kiel in 1912 and the Rendsburg High Bridge , one year later. It replaced a swing bridge located west of Hochdonn, which was removed and replaced with a ferry today. Since its opening in 1920, the bridge has been serving rail traffic between Hamburg and the Island of Sylt, located at the German-Danish border. 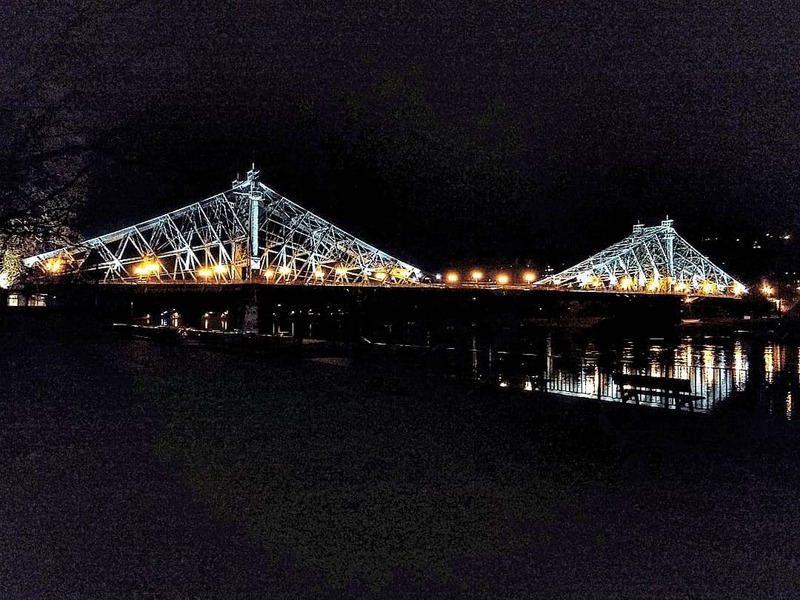 The only work done on this bridge was between 2005 and 2008, when the deck truss trestle spans were rehabilitated and the 42 meter high main span was replaced with a replica of the original bridge. In historic standards, it would have compromised the bridge’s historical integrity, but given the circumstances, and the fact that the truss swapping was necessary because the original span sustained severe corrosion making the rehabilitation impossible, it was deemed necessary to carry out this work while keeping the bridge’s integrity in tact. It has worked, as the bridge is still considered historically significant on the state level. A link with detailed photos of the bridge can be found here. The last two bridges crossing the canal are not only the westernmost bridges, but they serve the main artery connecting Hamburg and the Island of Sylt, passing through the cities of Itzehoe, Husum and Heide. The Hohenhorn Viaduct, built in 1989, is the younger of the two bridges, and serves the Autobahn motorway 23, which connects Heide and Hamburg. It was built as a relief to the main highway 5, although stretches of them have been replaced by the motorway since then. It still serves traffic today. The 390 meter long bridge features a similar main-span steel cantilever bridge to that of the Europa Bridge, but it one of the shortest bridges along the canal. At 2831 meters long, the Brunsbüttel Bridge, the last bridge before approaching the North Sea, serves the Main Highway 5, which runs along the North Sea coast. Built in 1983, the bridge, which featured a Warren through truss main span and two deck girder approach spans, is not only the longest bridge over the Grand Canal, but it is also one of the longest bridges in Germany. Given the landscape where the bridge is located, the bridge can be easily seen from a distance of as far as 10 kilometers in both directions. To sum up the tour of the Bridges along the Baltic-North Sea Canal, the canal is rich in history, not only in its construction and how the towns profited from it, but also the bridges that either used to cross it or still cross it. There are many bridges in shapes and sized that a person can see. Yet there is one bridge that was left out of all this, which we will get to as we approach Part II: The Rendsburg High Bridge. Here’s a map with the complete guide of the bridges along the Baltic North Sea Canal, which features both the Grand Canal and the Alt Eider, which the former supplanted. This includes both the Rendsburg High Bridge, which will be in part II and the Alt Eider, which will be in part III. Kiel is not included in the map as there is a separate one, but will be featured in Part IV. Special Thanks to Rainer Butenschön for the photos of the Hochdonn and Grünental Bridges and for allowing the author to use a couple of them for this article.